head. The ring is created in 18 karat yellow gold with a matte finish. The style number is M-04. 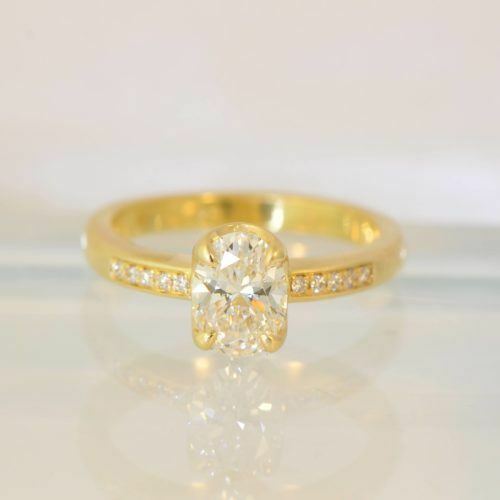 18 karat yellow gold diamond solitaire engagement ring designed and created by Rebecca Overmann. The ring features an old European brilliant cut diamond that weighs 1.59 carats. The diamond is accompanied by a diamond grading report from the GIA, #6187386504, which indicates that it is M in color, VS2 in clarity with Excellent Polish, Good Symmetry and No Fluorescence. The diamond is set with 6 prongs. The shank of the ring is slender and raises up to meet the solid undergallery of the head. The ring is created in 18 karat yellow gold with a matte finish. The style number is M-04.